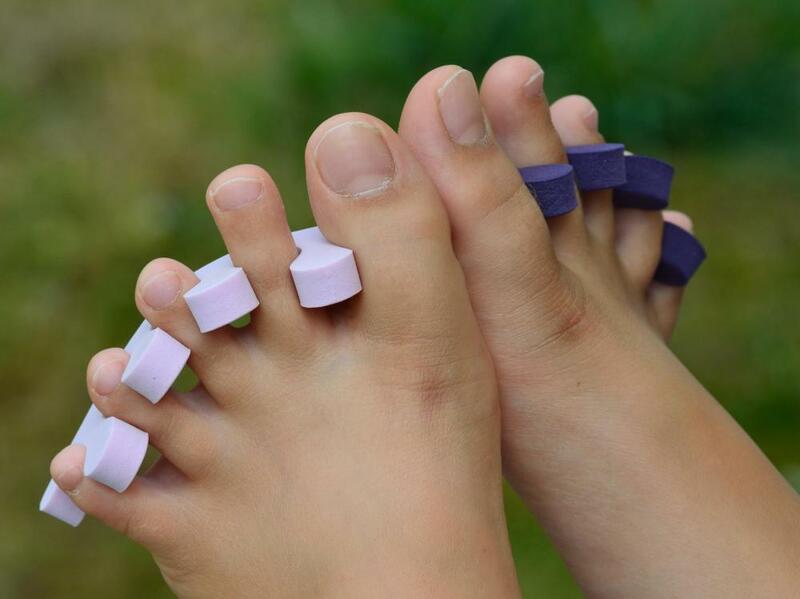 Toe separators may be useful when applying toenail art. Toenail art consists of a variety of decorative touches that are applied to toenails to make them appear more attractive. Nearly identical to fingernail art, with the exception of location, toenails can be decorated at salons or with home kits. Home kits either consist of predecorated nails that simply need to be glued on or a variety of accessories for creating a near-endless range of looks. Different elements used in nail art include polish, rhinestones, and stickers as well as glitter and foils. Nail polish can be used for toenail art in a variety of ways. Stylists use it as a base color, whether solid, glittery, or clear, over which other decorations can be applied. Specifically designed polish pens are available so that designs can be drawn on the nail. Stencils can also be used to brush on or airbrush different designs. Also used for nail art are specially designed nail polishes that produce decorative effects such as crackling or shattering. Rhinestones are available for toenail art in a range of colors, sizes, and shapes. The most popular shapes are round and teardrop forms because they are very versatile in creating different designs. These decorations attach to the nail with either glue or self-adhesive backing. Stickers, which are self-adhesive, come in numerous styles, colors, and images and include shapes that create designs or popular premade designs such as stars and insects. Glitter comes in different sizes, shapes, and colors. It can either be incorporated into the polish or dusted loose onto the wet nail surface during the decorating process. Finally, foils consist of thin, decorated sheets that are applied onto the nail with an adhesive, rubbed until secure, then trimmed and sealed. Toenail art should be applied to nails that are clean, dry, and well trimmed. Shorter nails are best because they rub less inside shoes and socks, helping to preserve the decorations. If the art is being applied at home, it is helpful to use a toe separator, which prevents the toes from rubbing and spoiling the design. A nail stylist starts by applying a base coat to the toenails in order to help the polish go on easily and be less prone to chipping. Once the base coat is dry, he or she applies the polish that forms the base of the design. After the nail polish has fully dried, the decorations — whether they be rhinestones, stickers, or a painted-on design — are added. The stylist then covers the design with a top coat to both help seal the toenail art and protect it from damage. How Do I Choose the Best Toenail Kit? How Do I Choose the Best Nail Art?